Just to the west of Minoc around the peninsula. History: The Aegis of the Light. A bastion of goodness, defenders of the Light. Heroes gathered to see that justice and freedom prevail. Knights, Mages, Healers, a scattered group of brave champions, each crusading to help the land, help others, and turn back the waves of darkness threatening to sweep over Britannia. Each of us lives to serve love, light, and all that is good. We strive to make the the world safe for future generations, fighting oppression, injustice, and those that would gather power unto themselves at the expense of others. This is the public guildtower for the Aegis of the Light dedicated to giving sanctuary to the virtuous to defend the land against the encroachment of evil. The tower encourages friendship and noble roleplaying. We are located west of Minoc across the harbor. Inside is a large Rune library to all other role playing establishments, towns and dungeons. Runes to the AoL tower are located in the YMCA, Havenhold and Avalon. This is a haven for those of good hearts and peaceful intent. Here’s a bit of trivia that is little known and probably not wanting to be admitted by owners of the Bard and Healer: It is said by a reliable source that their establishment, the tower that houses the Bard and Healer was the Original home of the Dark Tower several years ago, during the reign and terrorization of the Seer RPC troll known as the Dark One.When the Dark Tower was first conceived, it was housed at the tower now known as the Bard and Healer. Evidentally, theres alot of role playing history of the DT and other guilds there and that evil ‘events’ and ‘rituals’ took place within its walls. Ironic beginnings to whats now known as a ‘bastion of light’, no? 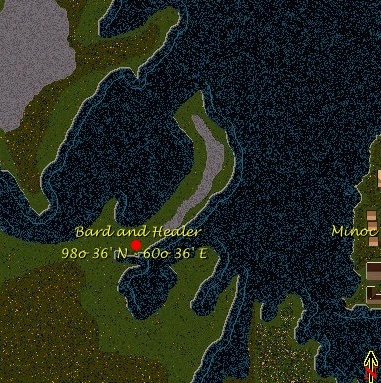 Currently, the Bard and Healer is being used by General Ibram Gaunt and his 1st army as a headquarters to help facilitate protective patrols of Ironwood. Aegis of the Light is a roleplaying guild on Britannia, the world of Ultima Online, the shard of Sonoma.